This post is sponsored on behalf of Ohio Beef. All opinions are, as always, happily my own. Thank you for supporting the brands that I love! My kids and I have this funny habit of making up crazy songs about whatever happens to be going on at the moment. It could be a song about stuffed animals, food stuff, or simply random thoughts. We sing them over and over and if we happen to create a particularly catchy tune, we pretend that it’s going to be published on our first album. Our first album, keep in mind, has been in a work in progress for the better part of 4 years. Yes, we are slow writers. The thing is, I’m a terrible singer but can string together a nonsensical song in about 30 seconds. Luckily, my husband tolerates this, although he often stares at us as if we’ve lost our minds when the three of us really get going on something crazy – which is almost daily. Now that C is in school, I look forward to the time when I get to go pick them up, bring them home and catch up on how their day was. This usually involves sitting up at the counter in the kitchen, having a snack, doing homework, and making up some silly songs. I am well aware that the days are numbered when they think everything I do is awesome so I’m soaking it up while I still can. And squeezing in as many squishy faced kisses as I can, too. It’s no secret that I love to cook. But now that my time with the kids is so limited during the week – with school, cross country, piano, and scouting – I don’t want too much time with them taken up with me having to make dinner. Yes, we enjoy cooking together, but during a busy school week, there is simply not time for that. Which is why my slow cooker will be parked on my counter for the next six months – at least. I have yet to find a person who does not appreciate the convenience and deliciousness of a meal prepared in a slow-cooker. 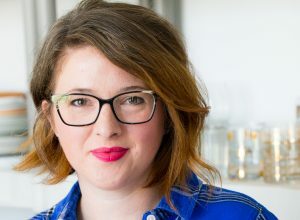 Knowing that my dinner is cooking away and will be ready either before or after evening activities (it’s flexible like that) is a huge weight off my shoulders. I like to mix up my slow cooker meals with soups, roasts and the occasional unexpected saucy dinner served over rice. Plus it makes your house smell incredible and who doesn’t like to walk in the door to that? This month, Ohio Beef invited me to share one of my favorite slow-cooked beef recipe for their #Crocktober celebration! That is my kind of hashtag, let me tell you. This roast recipe came to be when I had some leftover of my very favorite, knock-your-socks-off Bloody Mary Mix (minus the alcohol). I poured the extra mix over a 3lb Certified Angus Beef chuck roast and popped some potatoes around the edges. Woah, was the favor incredible! Since then, I have tweaked the amounts to be a better fit for the roast (less liquid and more seasoning) and the results were even better. When you are cooking your roast, be sure to cook your beef roast until it is 160°F and fork tender. 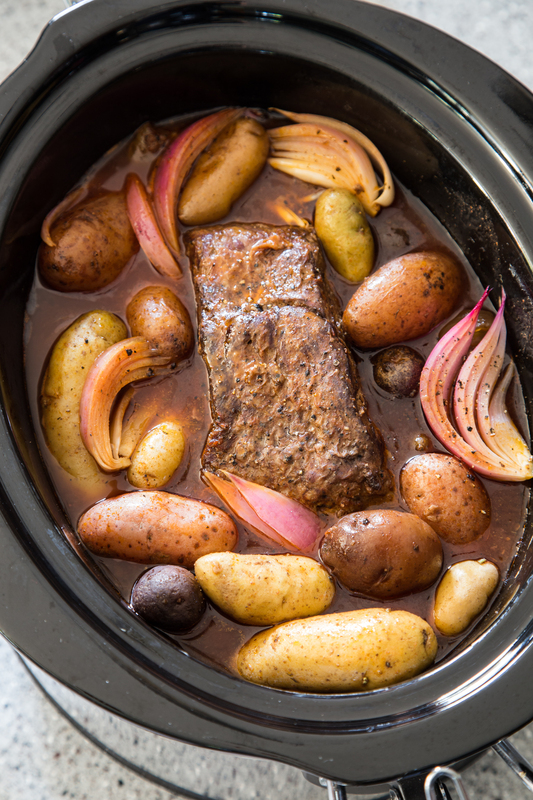 Serve your Slow Cooker Bloody Mary Pot Roast with the potatoes and onions. Don’t forget to top it off with some of the kicky Bloody Mary sauce. This has been a hit with my family and it is such a comfort knowing that I have a complete nutritious, protein packed meal ready for my family when we need it. It helps us avoid having to run through a drive through or throw together meals that are lacking in so many areas. I am proud to be from Ohio where there are over 17,000 beef farming families. I had the pleasure of visiting one first hand in the Spring and witnessing the excellent care they take of their animals and the environment. I like being able to take such pride in my home state when shopping for my family’s meals. To get your Fall cooking off to a great start, Ohio Beef is giving away one 6 Quart Crock-Pot® Cook & Carry Slow Cooker to one lucky Jelly Toast reader. This is nice, large slow cooker that will be perfect to try out my Slow Cooker Bloody Mary Pot Roast! To enter the giveaway, leave one comment on this blog post telling me you favorite beef slow-cooker recipe. One entry per reader, please. Giveaway for US residents only. 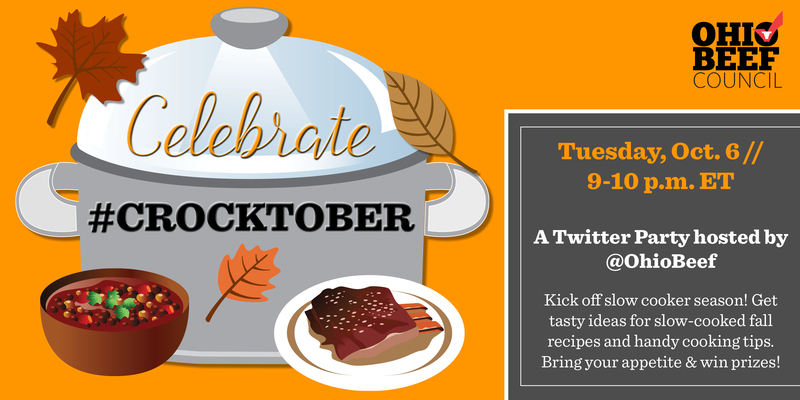 Good luck and Happy #Crocktober! Mix flour salt and pepper in a wide, shallow dish. Roll beef roast in flour mixture. Heat olive oil in a large skillet. Sear beef on all sides (about 2-3 minutes per side). 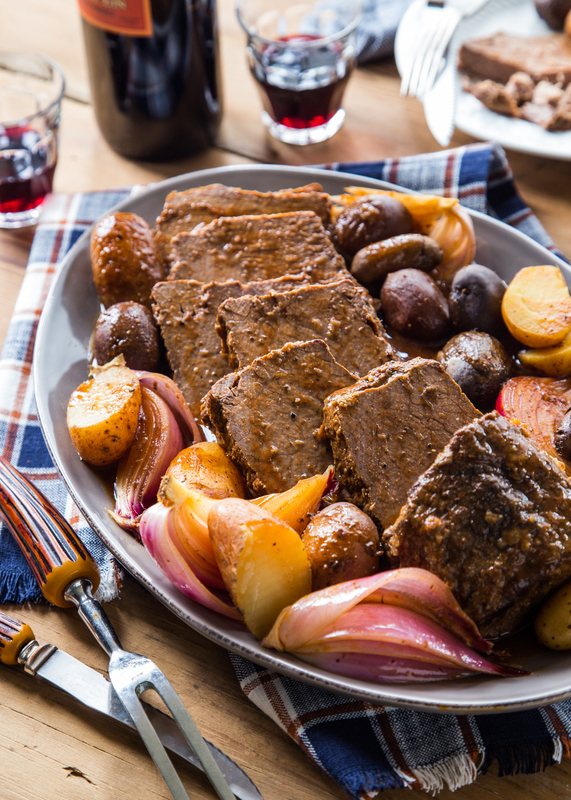 Place beef roast in a 6 quart slow-cooker and surround the roast with the potatoes and onion wedges. Add tomato juice, Worcestershire sauce, pickle juice, horseradish, racked black pepper, salt, Old Bay seasoning, celery seed, dill weed, and smoked salt to the slow-cooker. Set slow-cooker on low for 8 hours until roast is cooked to 160°F and is fork tender. Serve with potatoes, onions and extra sauce. Short on time? Skip the first step and place the roast in the crock pot un-seared. You will loose a little bit of texture on the beef, but the flavor will still be wonderful! it’s super lame, but i just like to put a hunk of roast in there with carrots, potatoes, and onions and cook it until it’s shred-able. comfort food at its finest! My favorite beef slow-cooker recipe is beef brisket with carrots, onions, and spinach. I’d have to say my favorite beef recipe is pot roast. Slow cooked all day til it is so tender. It’s often my birthday dinner of choice! 🙂 Pinned. My favorite beef recipe is just the Beef Stew, Its simple be tasty and has everything in it for the meal. I like to make beef with carrots and onions in my slow cooker. 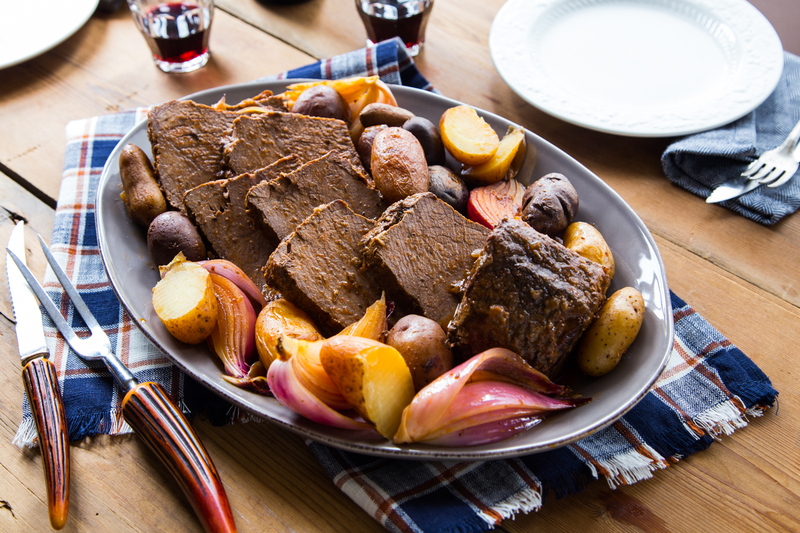 My favorite beef slow-cooker recipe is pot roast! I love to make beef stroganof. My family really likes it when I make that. I like beef stew with lots of veggies. I find the largest chuck roast w/o a lot of fat and brown in a little EVOO all sides, I sprinkle salt and pepper add cloves of garlic and quarters of my favorite sweet onion. I’ll had whole carrots and celery stalks. I cover and let slow cook on low for 4-5 hours. I make mashed potatoes and dinner is ready. The beef falls apart. It’s perfect for fall and winter meals. If I won this slow cooker it would really help us out as in Nov & Dec we are hosting many family/friends for 3/4 weeks during our daughters wedding in late November. I used to make a beef stew that went over pretty well. I love to make beef stroganoff. I like to brown a huge chuck roast and add onion and garlic when I’ve turned over so they are browned at the same time. I add to the slow cooker with seeded jalapeno peppers, cumin, salt and pepper and a can of chopped petite tomato. Then a take a small bunch of cilantro and lay across the top. I will slow cook for 4-5 hours. Remove and shred while cooking down the sauce for topping. We make taco’s, enchilada’s, any Mexican dish we’re hungry for. hands down – beef stew! So easy – just chuck roast (or stew meat), potatoes, carrots, onion, beef broth, gravy mix. that’s it! My favorite slow cooker beef recipe is Pot Roast with Sweet Potatoes and Carrots. I love making a coffee pot roast, just add carrots, potatoes, cabbage, sprinkle of onion soup mix and half a pot of cold coffee and cook low and slow. I like pot roast with coke, onion soup and a can of mushroom soup. I like putting dry ranch and dry Italian dressing on my pot roast! 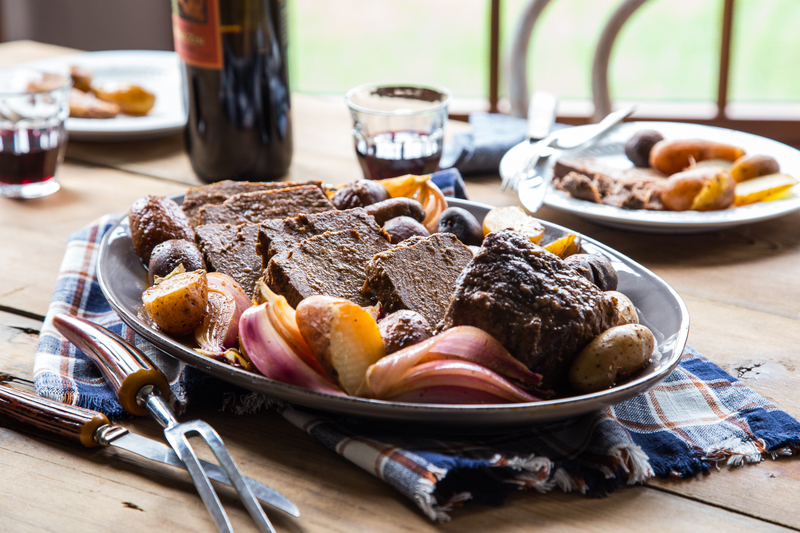 I love the bloody mary pot roast, Its the perfect comfort food for this time of year. Thank you, Becky! Winter screams for roasts, doesn’t it? !